There is a wonderful H.G. Wells story in which a taxidermist, puffed up like a Magnificent Frigatebird (Fregata magnificens), lists the feats of stuffing and mounting he has achieved so far: an elephant; a moth; a great auk; several human beings. His litany culminates, to the narrator’s enthrallment and horror, in the following remarkable boast. From “The Triumphs of a Taxidermist” by H. G. Wells. 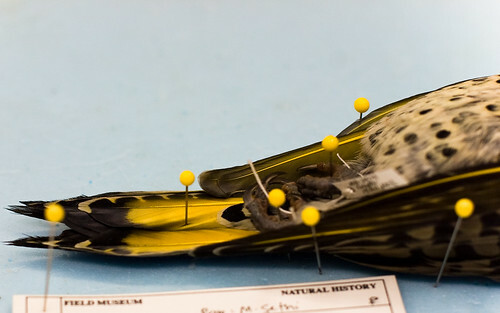 I have thought about Wells’s lunatic taxidermist many times recently, because four months ago I began preparing bird study-skins as a volunteer at the Field Museum in Chicago. 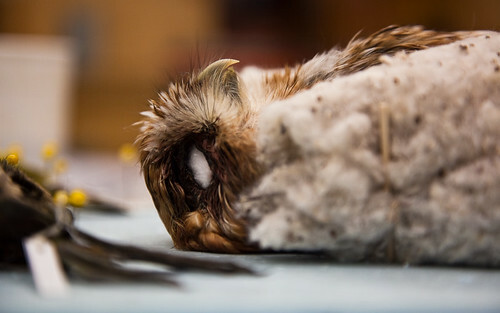 The birds I prepare are mostly local species, but some are migrants that are passing through; since I live in a city, many have died flying into windows. A vigilant group of bird-lovers rehabilitate the ones that make it through this experience alive; the ones that don’t are brought here, where they wait in a freezer until a pair of ready hands takes them up. My service here is a natural outcome of a triptych of fascinations with birds, death, and the body, but it has not come easily. It is difficult to skin and stuff a bird. It is especially intense work for someone unused to such meticulousness (most of the other volunteers at the museum are artists, their hands practiced with small tasks). My progress often feels halting; consulting my log, I see that my eighth bird, a European Starling (Sturnus vulgaris), was quite successful, while my twelfth, a Yellow-bellied Sapsucker (Sphyrapicus varius), ended up “a little ratty-looking and with lopsided wings.” Today is a small milestone: I have my twentieth bird in my hands. I do these things partly because I wish to memorize the bird in its original state. I need a picture in my mind to which I can return when later I must do my best to arrange its wings, feathers, and feet as they were in life. But partly, the gestures serve as an act of reverence for the creature I am handling. The back room of a science museum may also be a place where ritual is born. Lohengrin‘s aria happens to be playing on the radio as I carefully pry open the Tanager’s stout bill, my fingers running over the two tiny teeth along the edges of its upper jaw that helped it pierce the skin of fruits when it was alive. I tuck a small piece of cotton into its mouth with a pair of forceps, to absorb any blood that might otherwise seep out and stain the feathers. Something about this gesture comforts me, although I know that this does not make sense. Next I expose the Tanager’s breastbone and underbelly by parting its feathers with my fingers. Casual observation may not reveal this, but in most birds, feathers don’t cover the surface of the skin uniformly. Instead, they grow in dense, linear tracts, between which the skin itself is bare. I push the feathers to the left and right, uncovering a ribbon of skin that runs from the neck down to the lower abdomen. On some birds this is relatively easy, but very often the feathers don’t wish to stay where I put them, and from this moment on it will be an endless battle to keep them out of the way (without tugging too many of them out of the skin) as I work. The more beautiful a bird, the more carefully I arrange its feathers, and the more I curse them. Soon I am opening the bird from neck to underbelly with a series of light scalpel cuts down the skin of the midsection. Then I gently separate the skin from the abdomen and breast, peeling it up and away and depositing small amounts of sawdust on the exposed flesh to dry it a little and prevent feathers from sticking to it. The songbirds I usually work on can have paper-thin skin that tears at a thought, but in general what I find amazing is how elastic it is—and how, once it begins to come away, the muscle underneath seems like an entirely separate entity. It is perverse to say so, but I sometimes feel like I am peeling an orange, the skin designed to first protect, then reveal, the flesh. The evening after I skinned my first bird, I couldn’t stop prodding my own arms. I squeezed the skin between my fingers and tugged, noticing how of a piece my body felt to myself, and realizing how false that impression was. Once you have skinned a bird, it is hard not to imagine the whole animal kingdom opening up this way. When I have eased the skin far enough apart, I slip a small pair of scissors beneath the Tanager’s esophagus and trachea, snipping them both and making sure I don’t accidentally pierce the skin on the back side of the neck. Lohengrin is still playing in the background; the low, mournful singing suits my sober mood while I complete this task. There is not much room for sentimentality in the lab, but something about the sound of the scissors closing with a sharp click always ruffles my focus for just a split-second. It’s such a pragmatic sound, so decisive; it’s the kind of sound that should emerge from the workshop of a competent seamstress. And yet here I am, disassembling a bird. I can go a little faster, now, because the next several steps are relatively straightforward. One at a time I clean each limb, pulling the skin over the wing and leg bones, cutting them just below the shoulders and the knees, and cleaning the parts that remain. In the process I open up three small tears in the Tanager’s skin, one near the left knee and two near the left wing. They concern me only a little. It is amazing how forgiving a study skin is when it is completed; feathers will cover those holes, and there is no need for me to stitch them up. I only dab them with a little water to keep them from enlarging further. Now I am ready to pull the bird’s skin inside out over its head. I realize that this sounds gruesome. But the mere fact that it is even possible, and that the skin can later be pulled back over the skull like a sweater, with (if you are skillful) not a feather out of place, strikes me, like so much of what I do in the lab, as a complete magic trick. The Tanager is kind to me today; the skin works over the skull easily, I have no trouble pulling it away from the ear openings, and I am able to take out the eyes cleanly. As always, I marvel at how much space they take up in the skull; if our eyes were as large, I imagine that they’d go all the way up to our brow bones and down past our cheekbones—which would, perhaps, be a small price to pay for such acute eyesight. After making some cuts in the top and sides of the skull, I pull the back of the head away and clean as much of the surrounding flesh as possible. I take out the tongue, which always surprises me with its sharp shape, almost another feather itself. I shall draw a veil over the removal of the brain, which in a bird that has been previously frozen is not the neatest of tasks. With a cotton ball dipped in water, I clean out the skull cavity, then hold the bird’s head up to the light. Scarlet Tanagers belong to the large and varied order Passeriformes. Passerines share a number of common characteristics, one of which is that the bones of the skull gradually calcify over the course of a bird’s lifetime, fusing the bones so they become hard and continuous. This happens to human babies, too. I’m looking for evidence of tiny, grainy-looking calcium deposits, as opposed to areas where the bone is smoother and more translucent. The Tanager’s skull is fully calcified, which is not surprising; the color of its plumage announces its adulthood. Carefully, carefully, I pull the skull back into place. The skin is an empty pouch, ready to be filled. In order to do so I perform a series of actions: push a cotton-topped dowel up into the Tanager’s skull, to serve as a makeshift backbone; fill the eye sockets with more cotton; tie the two wingbones together across the breast, to keep the wings close to the body; pull the wingbones back into the skin; tie the feet together, to keep them organized and out of the way. Then I eye the size of the bird’s body on my tray and form a cotton replacement for it that is approximately the right size (a difficult task that is easy to misjudge). The body has a thin “neck” that I pull through the bird’s mouth with my forceps, settling it into place and tucking its base into the skin. I thread a needle, stitch the bird up as neatly as I can (would that I were a more competent seamstress), tie its bill shut, and finally smooth its wings and take a look. Relief. The Tanager does not have the smooth, compact perfection that it had before I began, but it doesn’t look like it was recently killed by marauding crows, either, and its lovely plumage is largely intact. I take a moment to breathe before I arrange pins methodically around the bird’s body on a piece of foam board, so it can dry in the proper shape. Incidentally, let no one tell you that scientists do not have an artistic impulse: On my first day, the collections manager of the Bird Division gazed at the finished skin I had spent four hours preparing (I have since cut this time down to an hour and a half) and explained, gently, that he preferred the birds’ heads to be pushed back, like so, beak parallel to the board, and their tails to be spread just a little wider, like so, fanned out slightly beneath the feet. True, a specimen with a low bill is easier to store flat in a shallow drawer—with a spread tail, plumage is easier to examine—but these small attentions in position, I note, also make a skin lovelier to contemplate. Conscious of the hope of beauty, the pinning process alone can take me a full fifteen minutes or longer, depending on the size of the bird I have in front of me—since tucking one wing into place may dislodge the other, and feathers, as I have explained, are disobedient. But eventually I am finished. Exhausted and proud, I wash up before making a label for my bird and pinning it by its side. “Prep. by: M. Sethi,” the label says, among other, more scientifically pertinent, information. Lohengrin has long since finished his aria, replaced by the sound of somber voices discussing climate change. They barely penetrated my consciousness while I was working, but now that I am listening, their conversation seems appropriate for my task here today. It’s a small thing, perhaps, preparing a study skin. It has no immediate purpose other than the deep scientific goal of furthering our understanding of the world we live in, part by feathered part. I never know how the birds I prepare will be used. Not long from now, an ornithologist may slide one out of a drawer to examine, or a scientific illustrator turn one hand to hand, staring at its coloring and shape. One day, perhaps years from now, they may teach a researcher how they are related to each other, or how their populations changed over time; their bodies may demonstrate, through silent, urgent, signs, the true peril our world is in. In some terrible future, not easy for me to contemplate, they may represent the only remaining examples we have of species that once filled the skies. I think this knowledge is partly why, although I love the wild, brazen arrogance of Wells’s visionary taxidermist, I cannot relate to his desire to improve upon Nature. How can we improve what we can barely preserve? My limited experience with taxidermy is so suffused with wonder over what is that it leaves very little room for dreaming up what is not. I can’t tell what these birds we prepare in the lab will reveal to science someday. All I know is how much they have taught me, in death, about their counterparts in life. I never forget a bird I have skinned. When later I see one swooping from a tree or singing overhead my breast fills with such pure joy that it is almost painful. I make one last adjustment to the Tanager’s feathers before I leave it be. I may not have created it, but I have earned a sense of ownership over it. And that is triumph aplenty. This is The Science Essayist’s inaugural essay. Future pieces may well be more technical, more personal, more specific, or more contemplative—I have no idea. Your feedback will always be welcome. Also, a special note to anyone who came upon this page while searching for help on making bird study-skins: The Manual of Ornithology: Avian Structure and Function has been an invaluable resource to me as I continue to learn about the ins and outs of bird bodies.